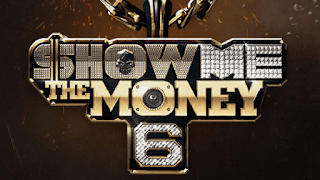 AAAAYYYYEEEEEEE it's time for another post on SHOW ME THE MONEY 6. This is round 6... SO FAST it's almost over :( so ya'll ready? So this round is always fun. It's a team diss battle! So Kim Jin- Pyo our host chose from the the teams from the box. And Zico and Dean (team CoDean) gets to chose which team they battle with in the team battle. They chose team Jay Park and Dok2 (team DoPark.) So that means Dynamic Duo and Drunken Tiger go against each other. I was really excited about this round when CoDean chose DoPark mainly because DOES THIS MEAN ANOTHER BATTLE OF HASH SWAN AND JUNOFLO!!!! so hyped. Will Won Jae use his Lyrical power to win? This is how it works 16 rappers left each team battles the opposing team in a battle of roast is what I like to call it. So you we have a 1v1 type battle and a 2v2 battle. Meaning either 1 person goes solo on another or 2 (team) goes against another. At the end the audience has banners either red or yellow and through the banner of the teams color on the stage whoever has the most banner wins. The losing teams must eliminate one from their team. Team Dynamic Duo and TigerJk & Bizzy go first. Before this even started I was so nervous because i really don't want anyone leaving my team FIGHTING TEAM DRUNKEN TIGER #teamtigerbiz lol First battle was Black 9 and Ryno. I was really conflicted with this one because I thought Black 9 was really good but Ryno decided to pull out the stops as well. Both of them are people we don't here of that much or at all so I was really rooting for them. I think Ryno may have one that one though. They did the 2v2 next. There was so much talk about them having to battle Woo Chan, I think there was a big culture difference. They talked about how they couldn't do a lot of things like cuss at him or roast him at all. My opinion... he signed up for this he knew what he was getting into. But Won Jae did it tastefully though. He was so good, I LOVE HIM SO MUCH!!!! Won Jae looked like he was having so much fun like he was smiling the whole time even when he was being roasted. Asol got on my nerves a little and her lyrics were kind of .... lacking. Winner hands down though is the Nucksal and the Woo Chan. When it was their turn something happened. It was like a magical click of chemistry. It was amazing, and though my bias has always been Won Jae I kinda forgot about him and was just LIKE YAAAA WOO CHAN AND NUCKSAL. Han Hae vs Maniac went last. This was a good match even though I didn't know what to do. I like Han Hae .... but I like Maniac more. Maniac's flow is real, like his ton his flow omg I just love him. But Han Hae showed up that day and he had the lyrical punches. It got time for the banners and to me it looked like it was a lot of team Drunken Tiger banners and I was like YES YES MY TEAMS GONNA WIN. Out of 200 audience members.... 114 for Dynamic Duo and 74 for Team Drunken Tiger, leaving my team at a loss... I honestly thought that was it for Asol her battle verse was kinda blah. BUT she made it further then a lot of woman so I was proud of her. Next up was CoDean and DoPark. This one I kinda figured DoPark would win just because I think the rappers on their team are more fun. Ness and Young B went first and Ness put on a HSR Blazer on to match Young B. When it came to it Ness was KILLING IT LIKE I WAS SHOOK. I think we all are shocked by Ness like no one ever thinks he'll be good but he turns out every time. But Young B didn't take that one sitting down he was mad and he was gonna show it. He came out swinging all in all it was a GREAT battle. Next was the 2v2 battle and of course Junoflo was gonna kill it. But I keep getting shocked over Woodie like idk I guess because I seem him as such a goofy character I forget that he has skill. they won that battle hands down. Hash Swan and Killagramz did well. But the team work for Junoflo and Woodie was just better to me. Hash Swan messed up his lyrics so I had a feeling they would lose and it would be it for team CoDean. Ja Mezz and Hangzoo were up next. Hangzoo hands down won this one for me. I've never been a huge fan of Ja Mezz from the beginning honestly. I don't think he's the worst out there but I just don't see how he's lasted this long. The winner of this match winds up being team CoDean by just a little. After all is said and done the two losers must eliminate a rapper from their team. DoPark eliminates Ness. I didn't agree with that at all. I thought Ness did a great job and I understand they are looking toward the future but still I think that Ness even with this less experience is a better rapper. ASol gets eliminated from team Drunken Tiger which i totally understand all the rest of their rappers did well I would have chosen her as well.